Charcoal is a material that can bind chemical compounds and molecules, due to its porous structure and the extremely large internal surface. “The intelligence of the material consists in being able to remove harmful substances from the water, although dissolved substances that our bodies need – such as minerals, salts and trace elements – remain”, says Holger Bubke. The now deceased company founder Sturmi Westerbarkey laid the foundations for the company in 1997, at a former LPG area, when he acquired the international patent rights for the manufacturing of sintered charcoal block filters. The company is now headed by his sons Dr. Peter and Jan Westerbarkey, and the workforce has since grown from three to 24 employees. Heavy metals such as copper and lead, but also chlorine, medicine residues, pesticides and microorganisms, lime and rust particles and many other substances that are not wanted in drinking water are retained in the filter, the cartridges of which are exchanged at certain intervals. Although Germany has a strict drinking water ordinance, more and more households are using these additional filters. “Many people attach importance to having the purest possible drinking water. Not all undesirable substances are filtered out in purification plants and waterworks; incidentally, only a fraction of the substances possibly contained in the water are tested for at all. The water ages on its way to the point of withdrawal through stagnation and transport into the supply networks”, explains Holger Bubke. As an internationally oriented company, at which engineers from the American parent company are sometimes guests, Nanostone Water GmbH operates on the markets of this world. This makes the company attractive to well trained new blood – even though the closest large city is almost an hour away by car. “In our experience, employees look in particular for whether there is a dynamic climate in the company. We score with young specialist staff, because we are not a big, unmanageable tanker, but instead a young, fresh company with the atmosphere and innovativeness of a start-up”, says Bernhard Bischof, who is not without pride when reporting of the company’s development. 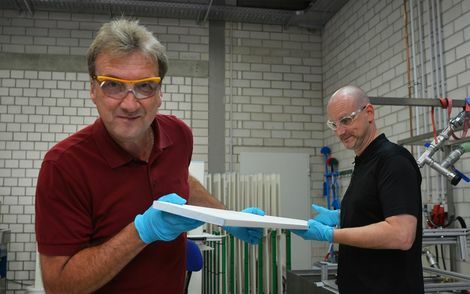 When he started in Halberstadt in 2012, the 17 employees could almost become lost in the factory hall, now Nanostone Water GmbH employs 140 people.